This early 1913 photo leads one to ask: Would the pedestrian standing in the middle of Front Street be willing to stand there today? The picture, taken looking north from a point that’s north of Mill Street (now Sunset Way), shows the striped barber pole (next to the utility pole) in front of William Garner’s Tonsorial Artist Shop. Baths are available there. 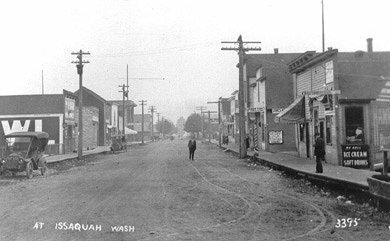 The sign on the side of the building next to the barber pole is C. R. Berry advertising his real estate office, which was there until July 1913, when he moved to the Issaquah Bank building. Note the wavy wooden sidewalks on both sides of the street.